Providing a structured, 12-Step therapeutic environment with a mind, body, spirit emphasis, English Mountain Recovery offers gender-specific treatment for males struggling with alcohol or drug use disorders. Our single-gender program is designed to recognize and meet the unique physical, emotional, and psychological needs of our male clients while encouraging clients to be vulnerable and open with peers, therapists, and treatment specialists. When it comes to addiction risk factors and therapeutic needs, men and women are not the same. Drug and alcohol addiction manifests itself uniquely in the lives of male clients, and the English Mountain Recovery team provides a gender-specific environment where men can be vulnerable and truthful with their housemates and therapists. Sexual tension and intimacy issues can derail an individual’s focus during co-ed recovery environments. When participants attend a gender-specific recovery program, “rehab romances” between opposite genders become less of a concern. Clients are free to focus on their recovery without filling voids in their life with intimate relationships they are not equipped to deal with. In addition, male therapy participants find it easier to be fully open about anger, trauma, depression, and other addiction symptoms. 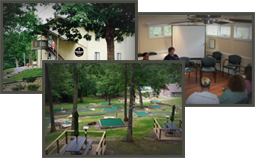 The serenity of our 27-acre facility is a refreshing way to begin gender-specific treatment, whether you are in therapy for the first time or rebounding from a relapse. Experience the benefits of gender-specific treatment and develop friendships that nurture you along your sobriety journey today—and tomorrow. Call our admissions advisors now: (877) 459-8595.